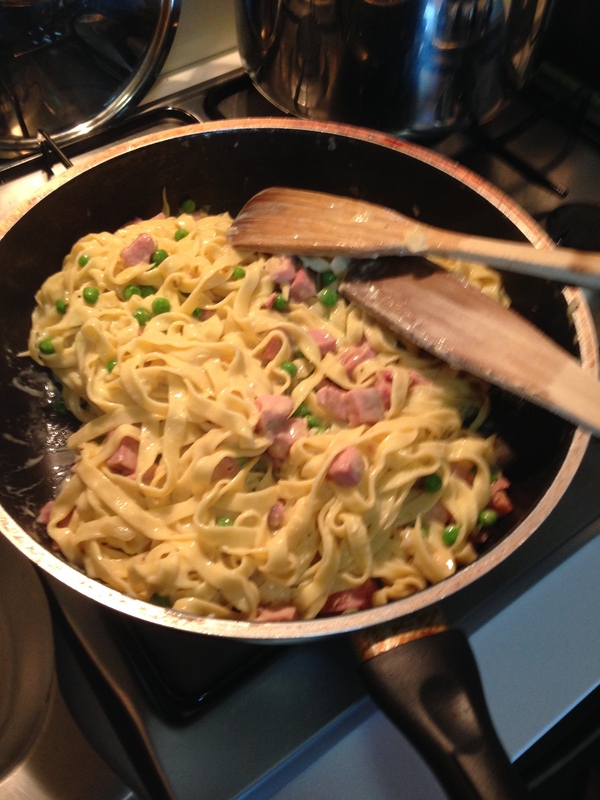 First anniversary – a retrospective on our home cooking! 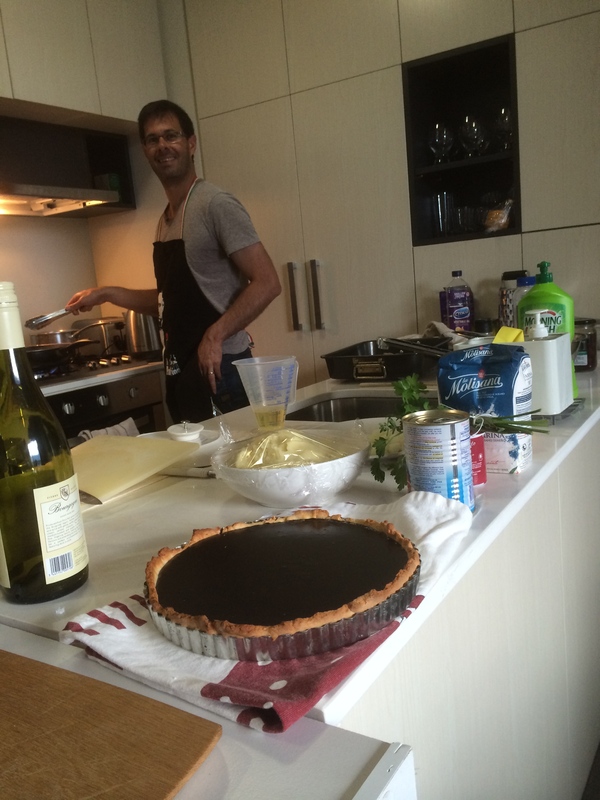 Getting ready for a dinner party – chocolate tart in foreground! I have never indulged myself and downloaded a few photos of some of the meals we cook at home. So to celebrate my blogging anniversary I thought I’d look through some photos from the last year that came out of our kitchen. Dinner is an important ritual wherever we are. For home, usually we buy enough for at least three dinners and then play it by ear during the week. Toscano’s is the epicentre of our grocery shopping. Not only does it have a terrific variety of fruit and veg, but it has great quality essentials from parmigiano reggiano to free range eggs to Istra bacon. Nearby there are high quality butchers, fish mongers and bakeries. For weekend emergencies it is loaves from Friends of Mine and when more organised it is Tivoli. Our kitchen is tiny, making organisation, and in particular, cleaning as we go, essential. During the week it is normally about staples, or at least recipes that we’ve done enough that we don’t need a book. When the opportunity presents, taking a recipe from one of our books, or Australian Gourmet Traveller is much more interesting. We cook lots of relatively boring dishes, but always with a bit of love. I worked as a kitchen-hand for almost five years going through uni and my curiosity for how dishes are put together ensured that I learned more than how to peel potatoes! In fact, in the mid 90s I worked at a place that was a break-out cafe, and the care shown with ingredients, and preparation of dishes from scratch, that epitomised that cafe, is now a theme in restaurants rather than the exception. 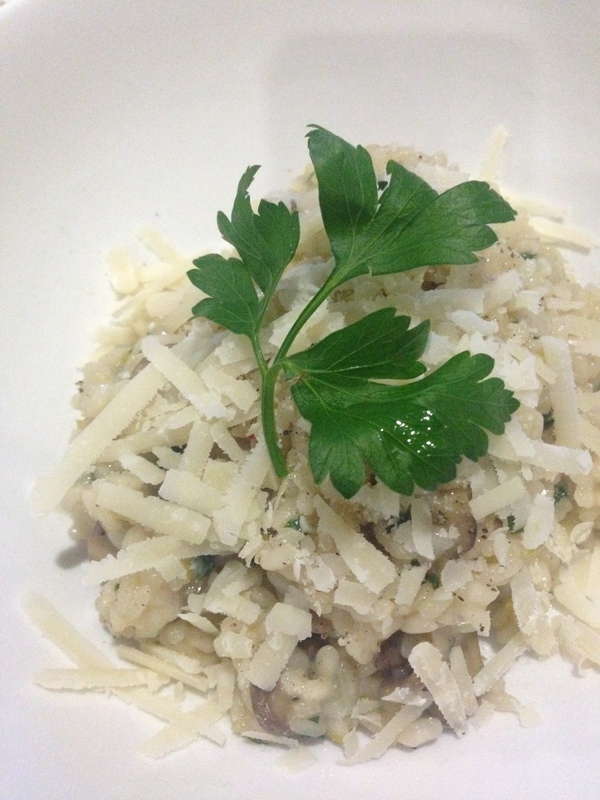 My signature dish, which my friends joke about, but took me many tries to get close to perfect, is my mushroom risotto. A lover of all things Italian, Catherine (incidentally half Italian) and I have worked hard to make pasta that is good quality. We’ve got there, but it is the kind of thing that you need to do regularly. On the other hand, with pizza dough, we are still learning. 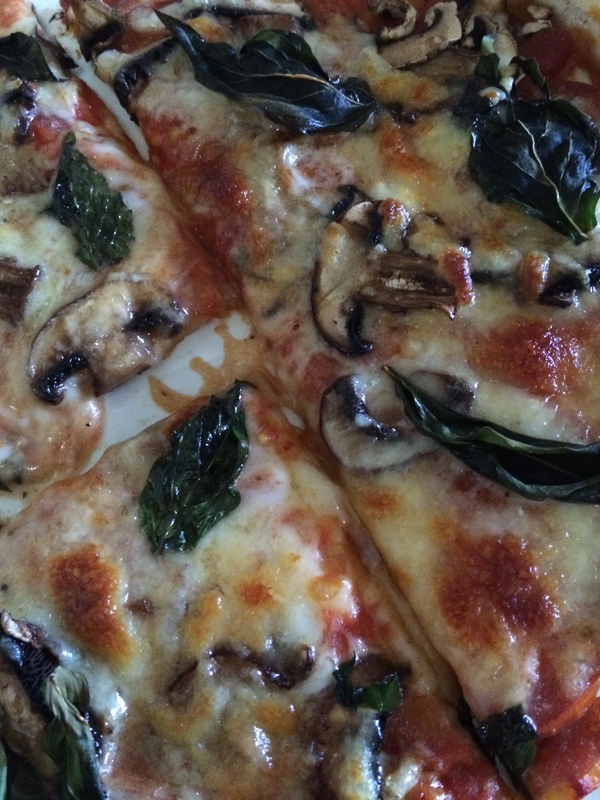 Not that we don’t love making pizza from scratch. Steak / fish / chicken, mash and veg is definitely a staple. Again, for many years I’ve worked on making a mash that is relatively healthy (no cream except for special occasions, and parmigiano on occasion too) but still delicious. The secret is pushing the potatoes through a sieve which allows the butter (essential! ), sea salt, cracked black pepper, and milk, to work its way through evenly. If you have properly cooked protein, beautiful mash, and crisp, just cooked vegetables that are bursting with colour, that is a good result in my book. For balance there is nothing wrong with frying up some calamari one night, and enjoying a healthier nicoise salad the next. 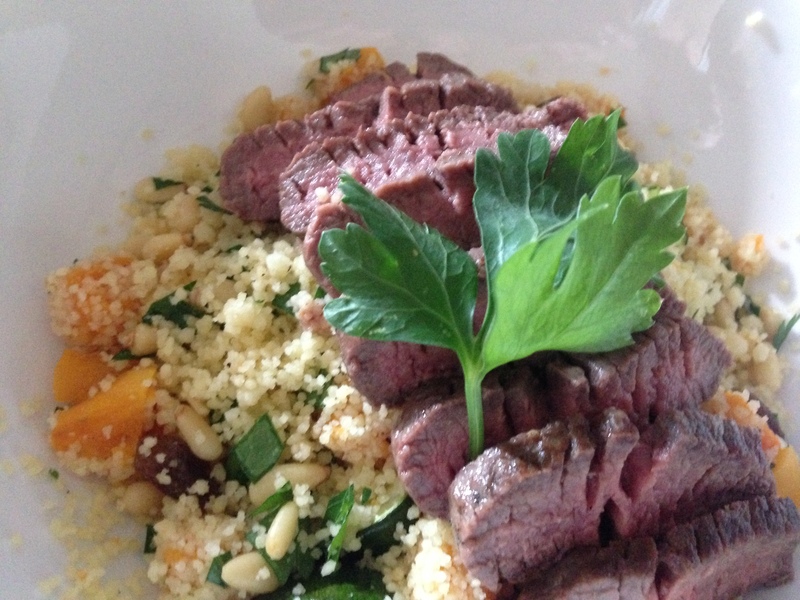 To change it up we’ll have lamb and cous cous (throwing saltanas, roasted butternut pumpkin and zucchini through, along with some lightly roasted pine nuts). 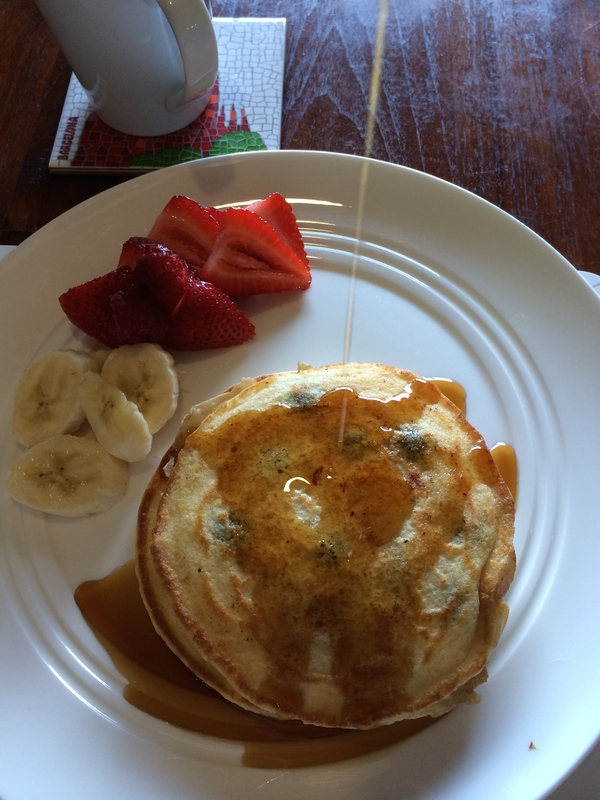 Equally, breakfast is boring weetbix during the week or some toast, but if we are not going out to breakfast on the weekend it is left over Istra bacon and fried or scrambled eggs on Tivoli bread, or simple blueberry pancakes with maple syrup. It’s been one year. I’m staggered that I’ve written over 115 posts, and I’m privileged to have people who read, and appear to enjoy this blog. This is my opportunity to give you some insight into how much I love eating, thinking about, reading about, and cooking food. Thanks. It is late morning. The weather is already quite hot and humid and in front of Melburnians is a kaleidoscope of event riches. Personally I’m off to Flemington for the Black Caviar Lightning Stakes, and then to the city to brave the White Night crowds to catch up with friends. Others have Soundwave, and then there are several other crowd pulling events across Victoria. There’s a great vibe. Over ten years ago I was here, but at night, and I was eating good quality Indian on holiday. Today, Catherine and I are enjoying a short wait on the pavement, and the old Indian restaurant is now a bustling Fitzroy cafe. This is a good introduction to the crowds we expect later on, but in no time we are seated on the front window. We probably wait longer to order food and drinks whilst sitting than actually waiting for a table but other than that the service is a fine standard. Our waitperson didn’t know the single origin which gave me the impression that the name Addict doesn’t mean it is a total focus on coffee. Not to say the coffee wasn’t very good as it was. As good was the watermelon juice – then came the food. 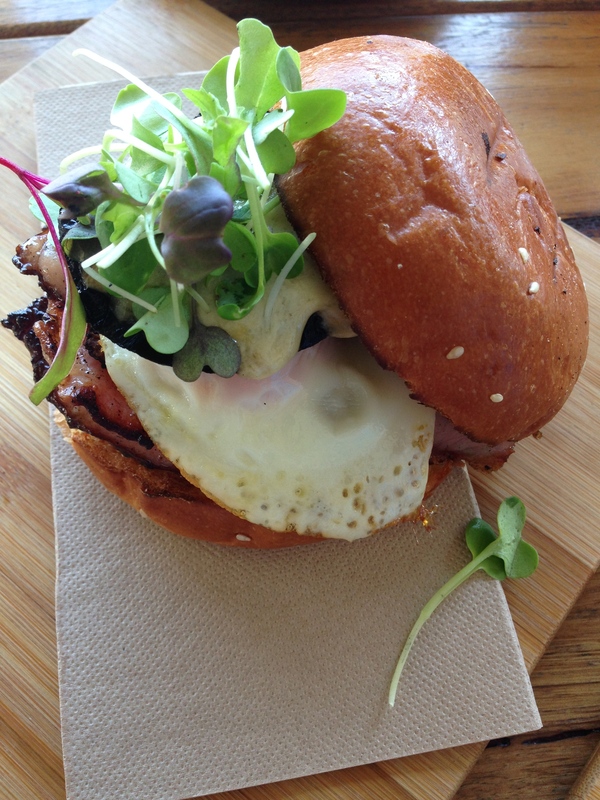 The breakfast bun was amazing. Every bite rich and delicious. With a beautifully formed brioche bun, plenty of flavoursome bacon, fried egg, and field mushrooms covered in gorgeous scamorza cheese. Hard to say that above all that the homemade brown sauce starred, but it was close and brought everything together perfectly. A breakfast winner. 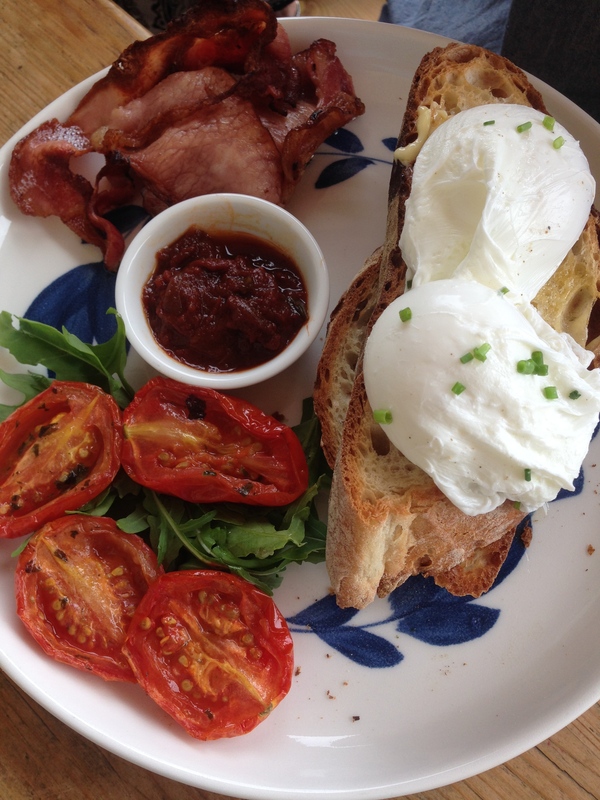 Catherine’s poached eggs with a side of bacon and confit tomatoes, did not live up to that level. The confit tomatoes in particular were soggy and lacked punch. The waitperson apologised for the juices from the tomatoes spreading over the plate, but there was nothing she could have done to avoid that. The eggs were nicely cooked and the yolk runny, but as a breakfast staple, this is a dish that has to be close to perfect at the best cafes. If there is one thing that acts as a factor in getting me back to a cafe, it is an exceptional dish. 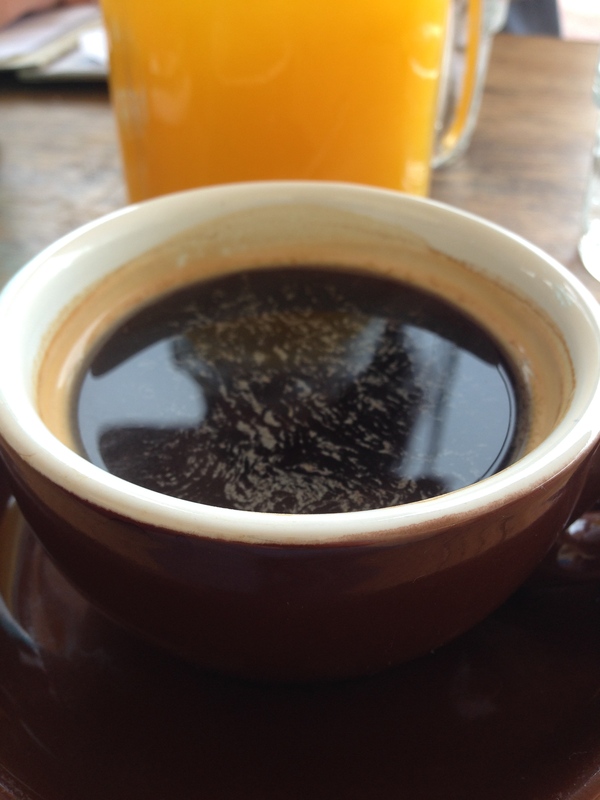 You need the backbone of a pleasant place, with good (read great by world standards) coffee, and quality food. 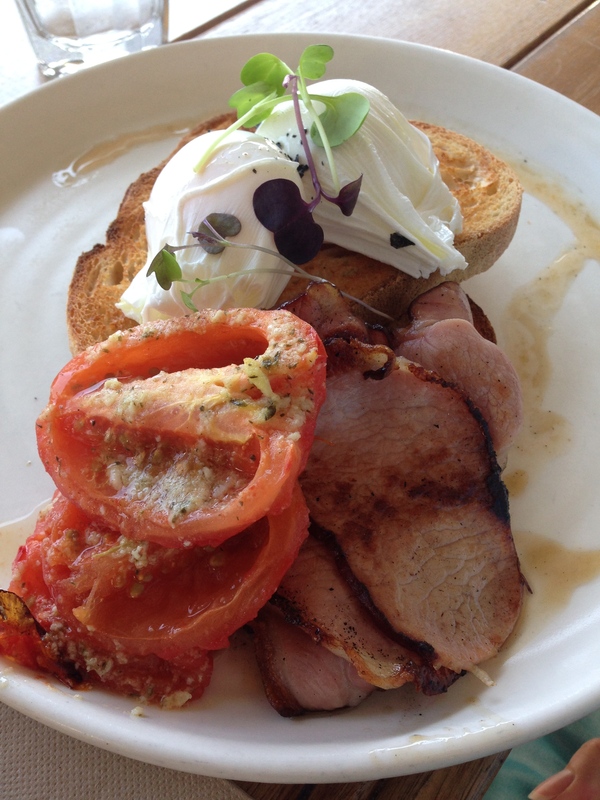 But an exceptional dish (or hopefully several) is what makes the cafe popular to people living outside of the suburb. The breakfast bun met that standard, and to add to that, I have the nostalgia of that Indian restaurant. You are elusive Mrs S. I’ve tried to meet you several times and several times for some reason or another your doors have been closed to me. There have been times where I would say I would not come back. If it wasn’t during Christmas/New Year break, it was lack of staff, or maybe just picking the wrong day. But today is the day. The reason we have always wanted to try Mrs S is not unusual. The reason is because every second mention of a good cafe in Perth seems to include this place. After a very short wait we are seated, handed the playful story menus, and explained that once ready you order at the counter. Luckily, ordering at the counter doesn’t take a long time but I disagree with this becoming a trend in many Perth eateries. My issue is there are plenty of staff to take food out so why can’t they take orders for breakfast. Comparatively, having to go and order at the counter for coffees, and then again for food, and then again finally for another coffee, not to mention again to get takeaway cakes, becomes cumbersome and unnecessary. That being said, the staff here are very friendly and even though they only take orders at the counter and bring out food, they seem to have a good rapport with customers both regular and not. 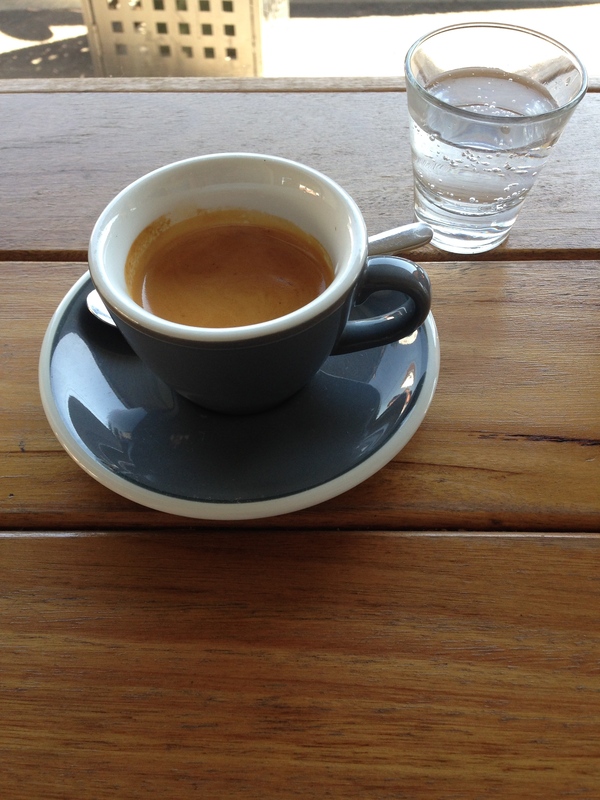 My first long black is over-extracted but still good, while my second ordered half full is much better. As breakfast arrived, I impulsively grabbed my fork and plucked some of Sher’s scrambled eggs from her plate. Not just zoolander good looking, they were also incredibly tasty, instantly giving overtones of envy and overwhelming want to come back! While Mum and Catherine had poached eggs, all of them agreed that the slow cooked tomatoes and bacon were excellent, but the bread was a little too thickly cut. Even though I wish I ordered the scrambled eggs,my Croque Madame was still good. Nice ingredients are used, but the bread again was slightly too thick and crusty, making it difficult to eat and adding too much crunch. 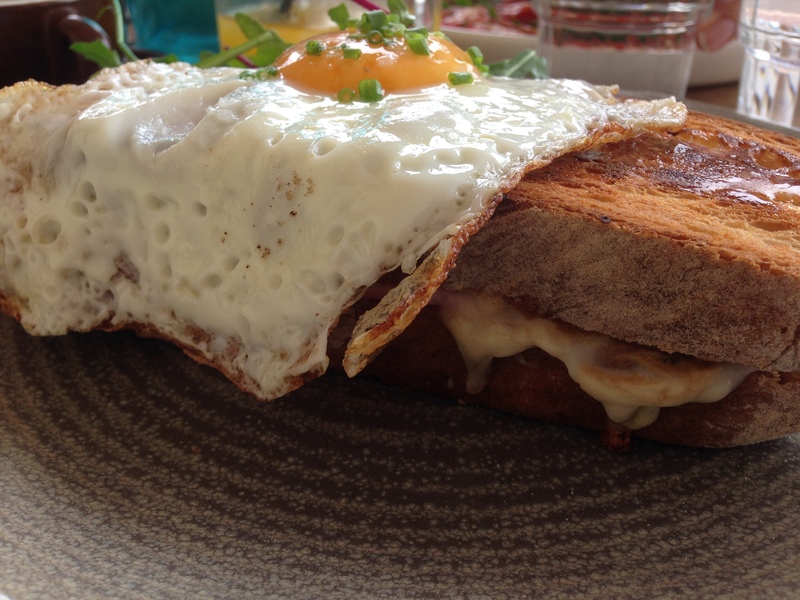 In fact, often a Croque comes with the crusts cut off for that very reason. The chutney was nice, but not traditional, and the side salad was redundant. If I’m having a Croque, anything healthy is not needed. The Maylands vibe here helps make Mrs S what it is. There’s a good collection of people for watching and lots of other cafes, bakeries and boutiques close by. While not everything was amazing, the food was delicious or close, and the coffee and juices excellent too. Our tastes of Mrs S’s treats as dessert later that evening turned out to be great too, putting it on the list for afternoon tea in future months. 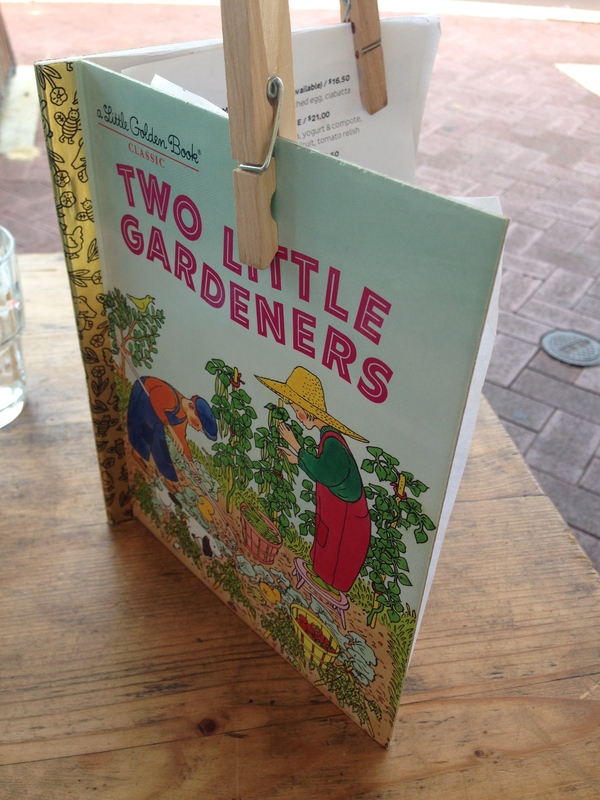 Having had a really good experience at Little Pantry some months ago for breakfast brought me back today for lunch. On that occasion I was surprised at the finesse of some of the Italian offerings ordered by others on the table. Today Catherine and I launch straight into lunch, sitting out the back undercover on a beautiful sunny day despite the humidity. Catherine ordered the ravioli. The dishes are all on a small clip board at the front counter where you order so we didn’t catch the full description, but the ravioli had what we believe was ricotta and silverbeet, in a rich tomato sauce. Freshly made, but not in-house, the pasta has that special texture and flavour that you only get when traditionally made. In fact it wasn’t expressed on the board so we asked following the meal to confirm and our suspicion was right. 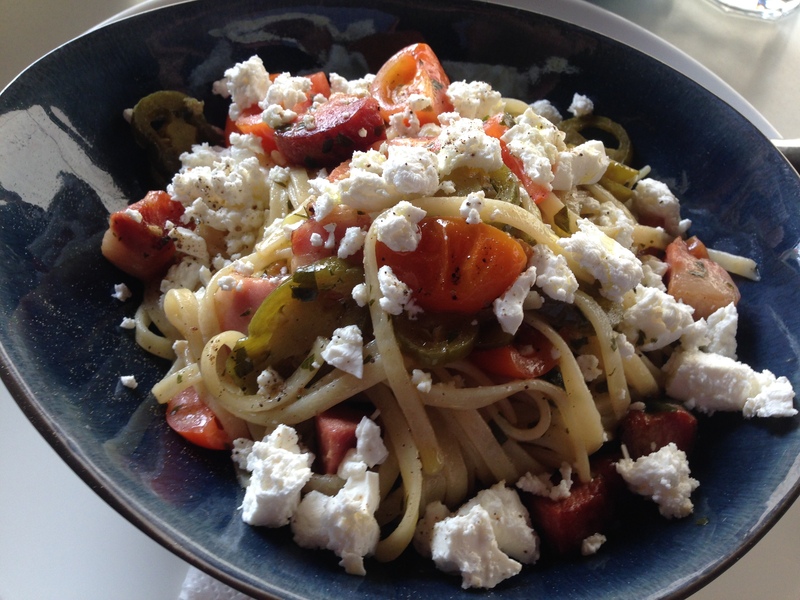 My spaghetti dish (which was closer to linguine) with cherry tomatoes, bacon and feta, was exceptional at the price-point. For less than $20 this dish had everything you could ask for – good texture from the al dente pasta, and fresh, good quality ingredients, that combine well. The bacon in particular was more akin to pork belly, cut thicker, with a good proportion of fatty flavour. We were in and out quickly to get to our next appointment, but there is no doubt we’ll be back for what is a tremendous offering at breakfast or lunch. As I approach my first anniversary on this blog there is no doubt that American barbeque is the hottest trend in the past year. It is not simple cuisine, but certainly isn’t the most difficult to execute, and has the favourable aspects of being easy to share, and completely delicious in both a high flavour and high guilt fashion. Having been past for a drink a few months ago, I have had Pleased To Meet You on the short list for Perth ever since. Tonight is the night Catherine and I get to try some of the offerings of the chefs here. Luckily we are here relatively early and get a seat at the bar. Unusually you order your food at the counter, so the bar is actually the only place you get service without going up. I say unusually because it gives the instant impression at busy times that this is akin to a take away or dine in style restaurant. To me, that impression is not commensurate with reasonably expensive food. Looking down the menu I am expecting high quality and great execution given the price for one slider is $9. To my pleasure, I can say that my expectation was generally met. Interestingly my first impression that this is American barbeque is tempered by some of the dishes on offer that have their origin in Vietnam, China and other Asian countries. American fusion perhaps? Besides a slider each, we order the squid bahn mi, beef tongue ruben bao, chicken taco, and peach salad. 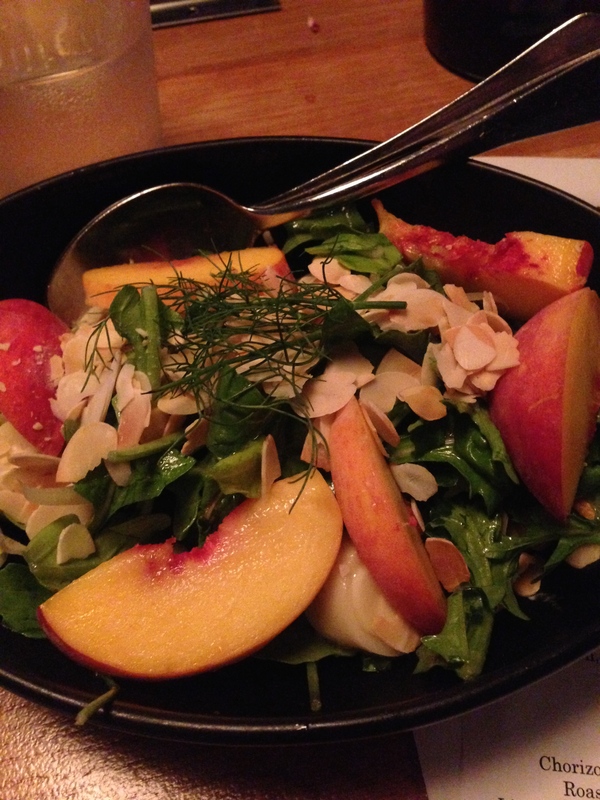 The first dish we received was the peach, fennel and palm heart salad. 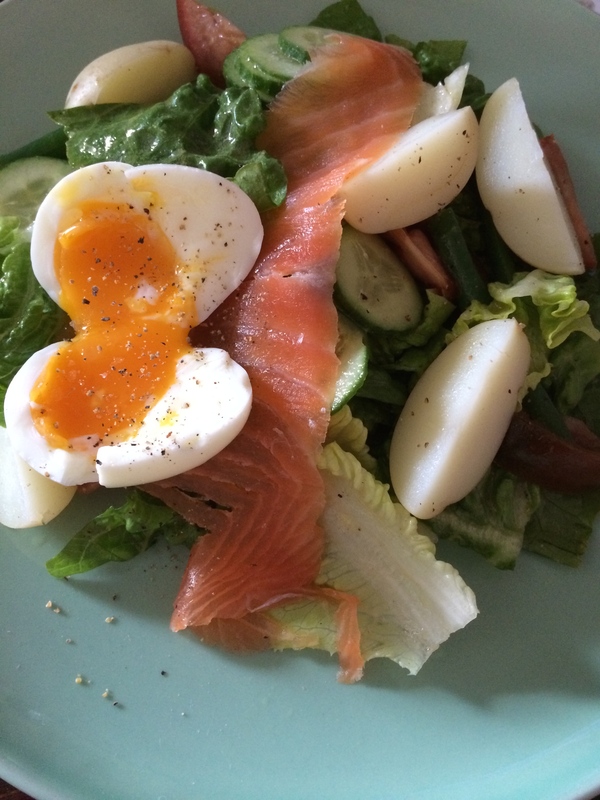 Peaches are amazing at the moment, and they are amazing in this salad which is inspired. The combination is beautiful, and the dressing only adds to the flavour with dill, almonds and rocket thrown in too. It was initially questionable that the salad came first given the rich food we were going to be eating, but we kept half of it to refresh ourselves through the meal. 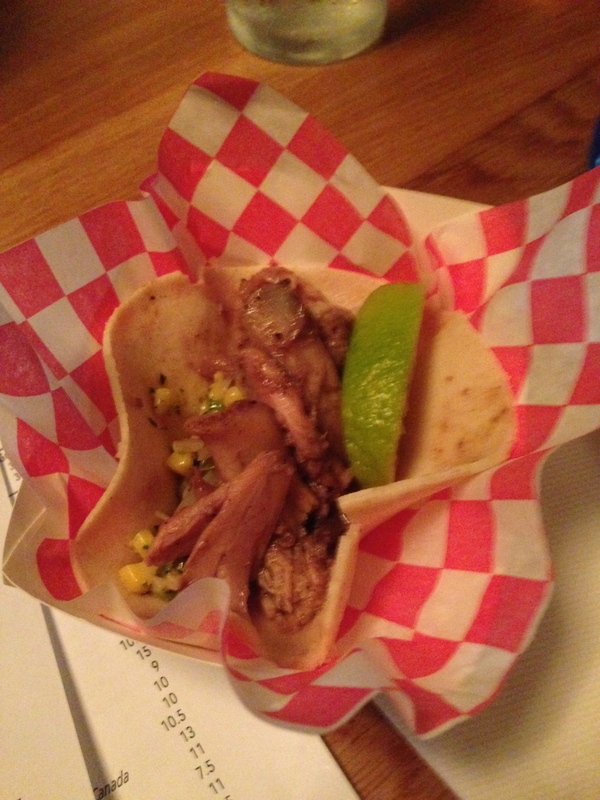 Next came the chicken taco which is tiny. It packs a good punch of flavour from the chicken which has been on the rotisserie (you can have a plate of the chicken if hungry or in a bigger group for only $30) along with a gorgeous sweet corn salsa. It’s a nice dish but hardly there and the pickled cabbage addition (a theme in a few dishes) is not needed. 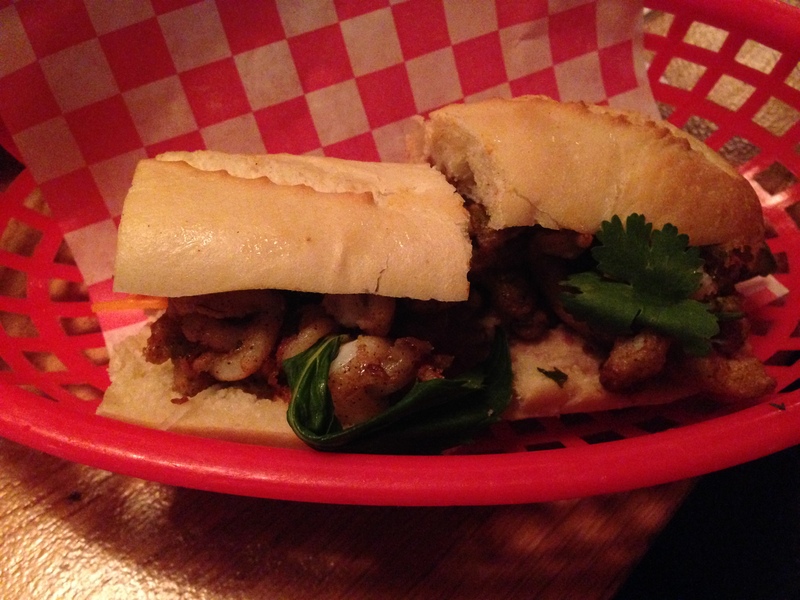 The bahn mi on the other hand is more substantial. The make or break in this roll is the squid, which is beautifully cooked with a smoky grill flavour. The roll is fresh and after one bite I couldn’t stop until it was gone! 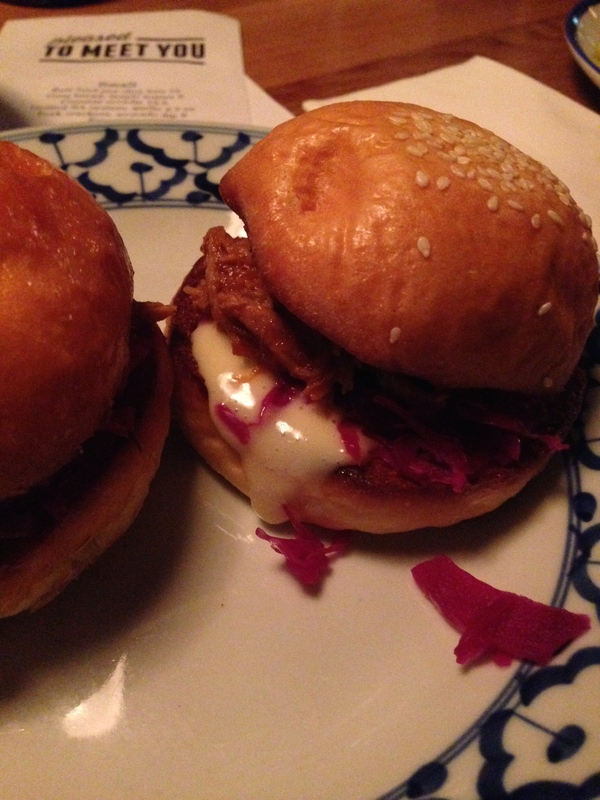 Next came the pulled pork sliders which are a better size. The pulled pork is tasty, but no more or less than most good cafes, but the brioche bun stars along with a good helping of chipotle tasting sauce. Last I tried the beef tongue ruben bao. The execution here of the bao makes it easy to tell that steamed buns are not the focus of the chefs. 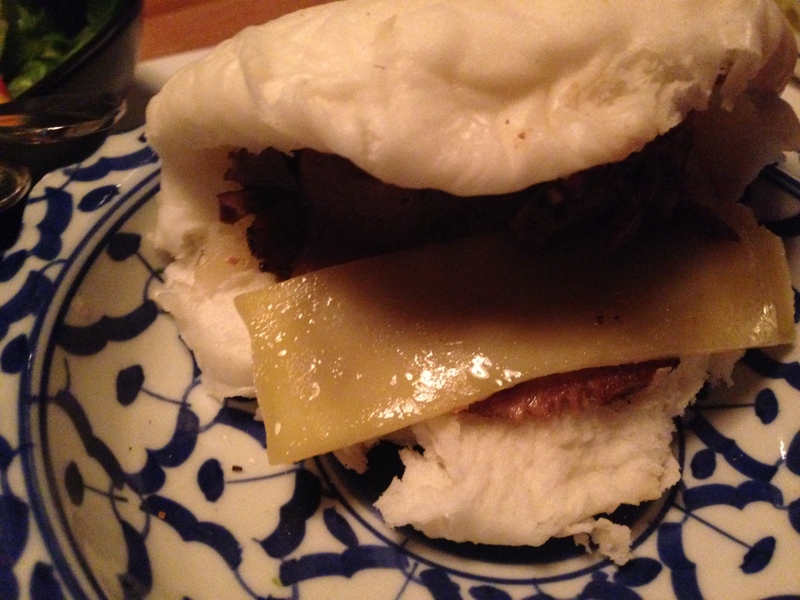 The beef tongue is excellent, but the bao needs improvement. 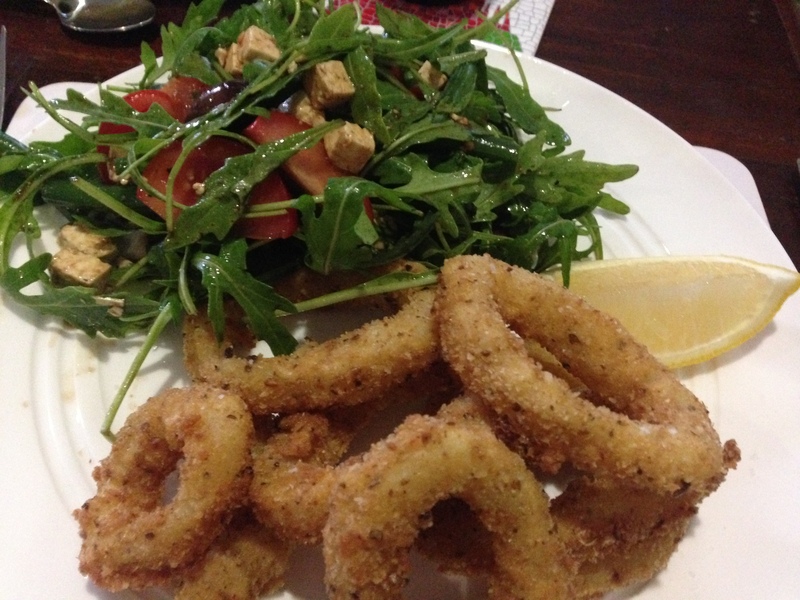 We had enjoyed our meal, getting to try some terrific snacks and an amazing salad. 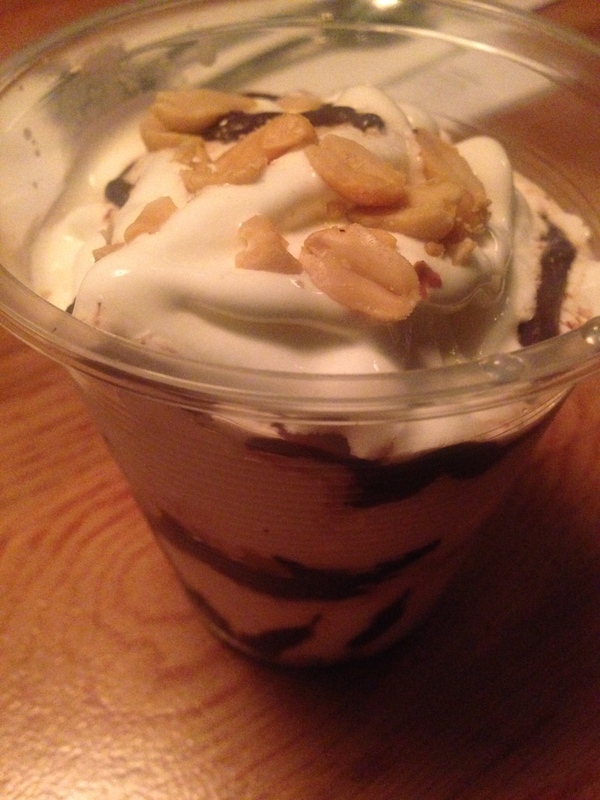 Instead of trying one or two more dishes we decided to share the chic sundae. There is gimmick in the presentation, but the whole dessert does not work. It is one of the most disappointing desserts we’ve eaten in some time. Soft serve lacking in flavour, a few peanuts and some chocolate sauce that is plain. I completely understand it is only $6, but my suggestion would be do it properly or take it off the menu. With a nice selection of beer and wine, the bar is a worthy place to just have a drink. While it is counter service, the staff on the bar were good at answering questions and offering suggestions, and the food came out in good time. The space works with several communal tables, some more intimate spots towards the front, and plenty of bar space. It is refined, playful, and attractive. Pleased To Meet You provided a different experience and one we enjoyed. Next time we’ll come with a few others and try some of the heavier meat dishes that look fantastic. With Da Vinci’s unfortunately closed, Mum and I had no choice as we sat in the carpark on a Tuesday evening. We had to find good Italian that is reasonably priced fast. Urbanspoon to the rescue. Not far away in the Avenues of Mt Lawley, Threecoins Italian Trattoria seemed a good option and what’s more they had a spare table for two. My figurative take away tonight was, if you hesitate, like I do, at eating in a small shopping complex, you may miss something special every now and again. It was busy! A slightly illegal park, a friendly greeting, and in no time we were seated just outside in the undercover but alfresco front area. The restaurant is styled in minimalistic Italian trattoria fashion. Given it is located on a main street in a small shopping complex, it is surprisingly ambient. On top of that it is nice and warm; a comfortable night to be eating outside. 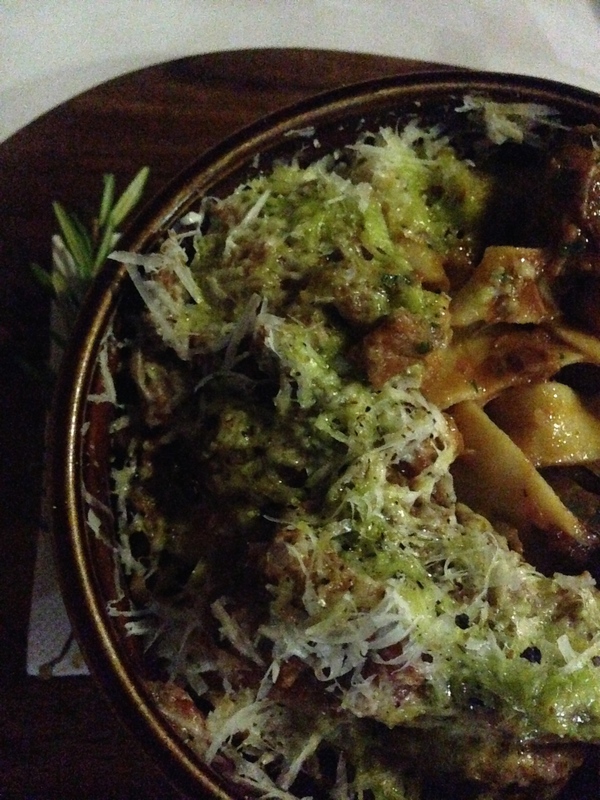 The menu is your usual informal Italian with an asterix being the completely homemade pasta options on offer. The growth in homemade pasta being offered across Perth is fantastic. Here they are served in clay bowls that add some interest, and keep the dish warm. At first the serving looks on the small side, but given the dishes are rich and good quality, not to mention reasonably priced, we are happy. My pasta is a fettuccine with a lamb ragu. The pasta is nice and firm and holds together. I’m curious on the lamb ragu at first because there are quite a few defined chunks rather than being almost dissolved through the sauce. Luckily, it is very tender and has good depth of flavour making for a nice dish. Mum’s ravioli of pumpkin and taleggio is even richer, with a white truffle oil, and a burnt butter, sage and parmesan sauce. Again it comes in a clay bowl, and there is a good serving given the richness. 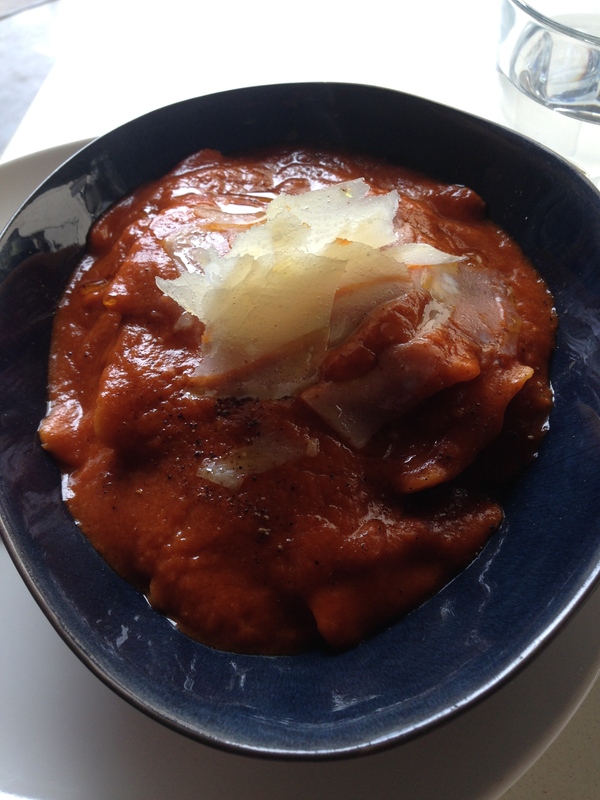 Out of the two dishes, the ravioli is the star. Both dishes were mopped up with bread from the selection, which includes grissini and flatbread amongst others. For dessert we share the mille fogile of strawberry and Chantilly cream with other berries scattered through and white chocolate too. 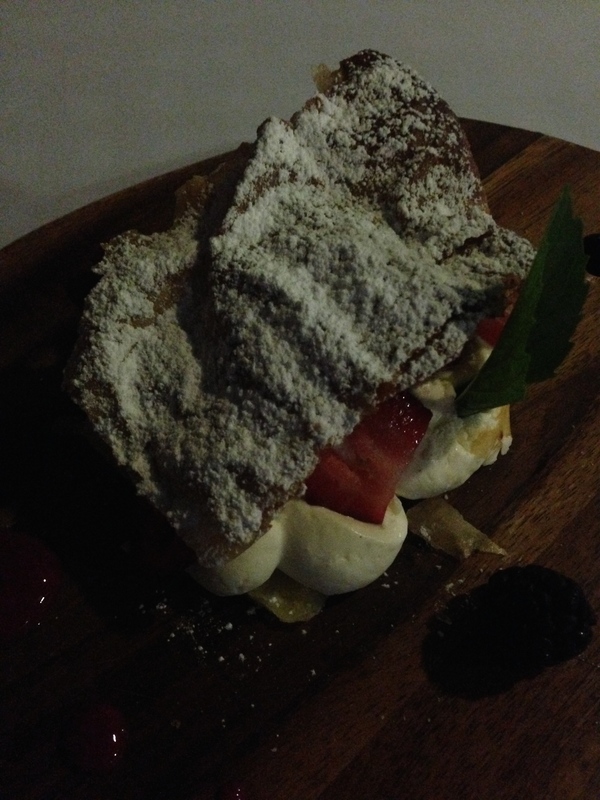 For a simple dish it is well executed and the puff pastry is nicely cooked. The slightly sweet cream and strawberries are a classic combination, providing a light end to the meal. One plus for Threecoins is the ability to bring wine to the restaurant for only a small corkage per head. The service at times seemed a little inexperienced, but this was made up by the politeness and friendliness of the couple of waitpersons who served us, and some nice touches like holding dessert until we were ready. The restaurant is popular and should look at better stemware, but other than that our craving for good and reasonably priced Italian was well and truly catered for. The depth of cafes in Melbourne is only tested once a year. As deserving as the staff are of their holidays, what becomes of the patrons left behind? There is a lot of weight on the owner’s shoulders as they decide whether to open with a skeleton staff, potentially hurting the reputation of the cafe, and balance this decision with whether any of the regulars will actually be around. This seems to be where economic theory comes to the fore and the balance of those able to open, with those taking a deserved holiday, is struck somewhere that sits well with me from a potential profit perspective. Hobba is one of those who were able to be open on this Friday in January when others down the road were not. The quandary in checking out a new place at this time of year is whether it is going to provide a fair review. My answer is that if you are open you give it your best, and if you can’t, you close. Hobba was busy, but we were able to get a table for two straight away. There was absolutely nothing out of place, and the joint was purring over a normal Friday lunch. My Pedro Burger was great. The Mexican spiced grilled chicken nicely cooked and tender, the coleslaw adding crunch and flavour, and the chipotle mayo especially delicious. 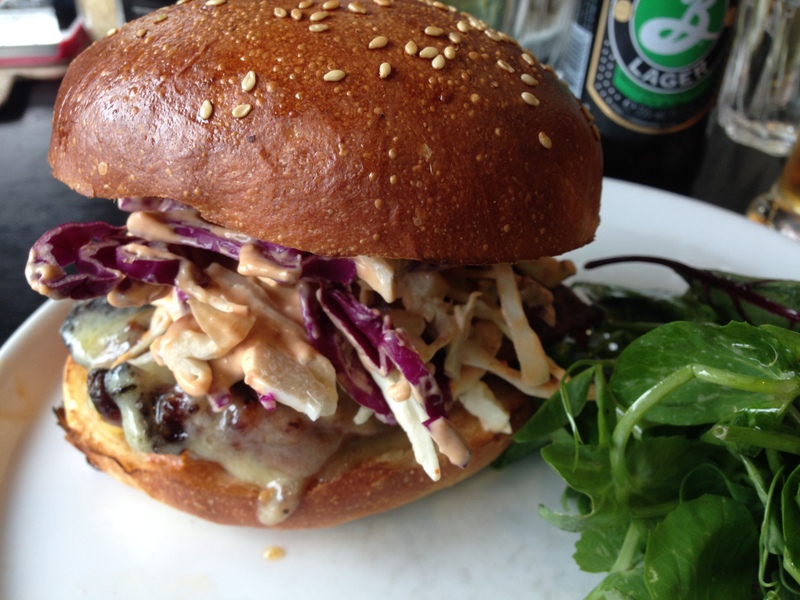 Housed in a brioche bun that is not getting old on me anytime soon, the combination adds a bit of interest to what could otherwise have been just another burger. 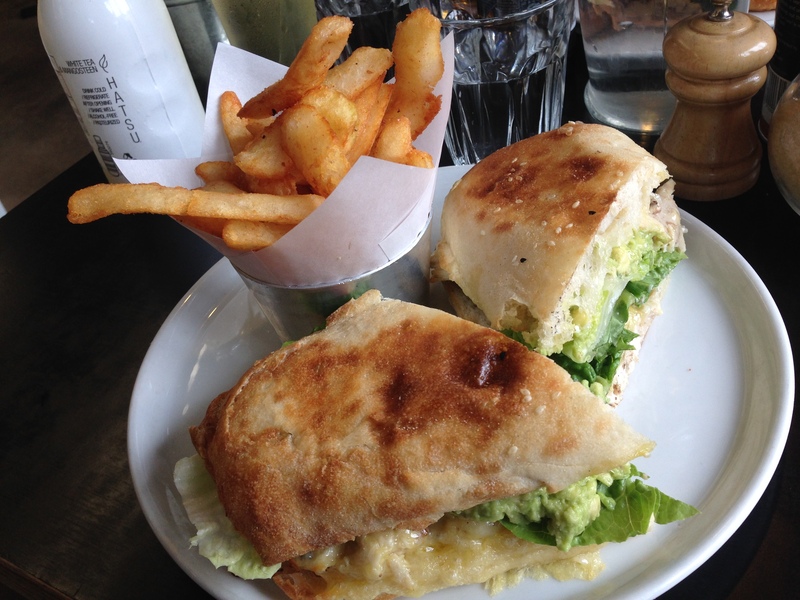 Catherine’s “Fowl Play” chicken sandwich in ciabatta bread was also good. Almost enough of a serving to share for smaller appetites, it will filled with avocado, cos lettuce and tasty cheese. The warehouse building is airy and bright, holding a large cafe crowd. The service was good, even though the staff seemed to have a lot of tables to handle, and drinks (both alcoholic and not) arrived nice and quick. Judging by the crowd here, and having eaten a good quality lunch while other nearby cafes were closed, I suggest Hobba’s owners got it right in opening.